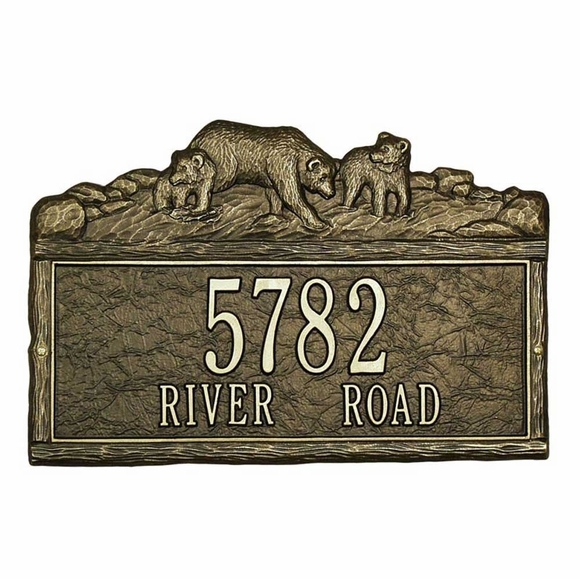 Personalized Address Plaque with Bears - - Woodland bear theme address sign holds two lines of personalized text and an image of three bears at the top. Made in USA. Available in four color combinations: black with gold characters BG (large image); antique copper AC (small image); green with gold characters GG; bronze with gold characters OG. Dimensions: 15.75"W x 10"H; weighs 3.72 pounds. Bear theme address sign for lovers of woodlands and forest dwellers. Made in USA. Absolutely better than I expected!! And arrived a couple weeks ahead of schedule! Couldnt be happier with my order!! We love the sign. Very good quality.